I found the following news item; if you can read Spanish, you will most probably prefer the original version in the Proceso magazine's site. The subject? The federal police (PGR) and army arrest 17 artisans for «making money out of» Spiderman. The following translation is mine. Done past midnight, and being quite tired, and translated so this news item can reach a broader audience. All errors are mine (except those carried out by the security forces, that is). Cuernavaca, Morelos. Policement from the General Republic Attorney (Procuraduría General de la República, PGR) and the Army entered and searched the "3 de mayo" neighbourhood, in the municipality of Emiliano Zapata, detaining 17 ceramist artisans that sold candies, dolls and piñatas shaped like Spiderman. This search was done on the evening of last Wednesday, around 16:00. Federal ministerial policement and army soldiers closed a street with several informal stores and detained workers taht were selling this Marvel Comics character, following said company's denounce. As a result for this operation, 17 artisants were detained, although the same day five of them were freed. The policemen also seized 12 bags of candies, piñatas, ceramics and wooden figures of the superhero. PGR closed down 11 stores where ceramics with this same figure was being sold, accusing the detainees of plagiarizing Spiderman's image, protected under the copyright law. The 12 that remained under detention were put at the Federal Justice's disposal, which prompted that this Thursday, around 10AM, hundreds of sellers of "3 de mayo" went out to PGR's building to demand their friends' freedom, who are facing a bail of up to 200,000 pesos (~USD$18,000). Outraged because –they said– they were treated as if they were part of a drug ring, hundreds of artisans closed intermitently Avenida Cuauhnáhuac, where the PGR representation in Morelos state is located. The artisans' pressure helped for the amount of the bail to be lowered from MX$200,000 to MX$16,000, and so they were set free. Francisco Fernández Flores, president of the Ceramists Association, criticized the operation because, he said, it was as strong as if they were "drug dealers". The artisans explained that they don't even make the Spiderman figures, they are made by the interns of the Centro Estatal de Reinserción Social de Atlacholoaya (prision), located in the Xochitepec municipality, who offered them to the ceramists so they could be sold. "The Atlacholoaya inmates do them, we buy them to support them, and turns out we are the delinquents now", said Miriam Monroy, sister of one of the detainees. This information was contradicted by Jesús Valencia Valencia, responsible for Morelos' state prision system, who assured that in said prision no ceramics are done. Fernández Flores insisted though that from within the prision they are being offered piñatas, candies and "piggy banks" with Spiderman's shape. José Luis Pozo, vicepresident of the Ceramists Union, said that to avoid more such federal operations for copyright breaches, they have committed not to produce or commercialize Marvel superhero figures, and any other characters the authority demands. "We do commit to, from now on, those products singled out to us will not be commercialized", he said. Pozo said that the PGR operation caused losses not just to the detained producers and salesmen, but to over 200 ceramists that had to close their stores in solidarity with their friends. Acording to the artisans, the products were a success until the PGR came, seized the products and detained the salesmen. And yes, the copyright insanity does not stop. Spiderman is by today a clear part of popular culture. Marvel brilliantly succeeded in creating such a popular icon that everybody recognizes, that everybody identifies with — And that everybody should be able to recreate. We are not talking about brand protection. Marvel does not, and will never, commercialize piñatas, ceramics or wooden toys. And even if they were plastic-cast — While Spiderman is still under the protection of copyright, as the Berne Convention defines it (and of course, as the much stricter Mexican laws agree), that does not mean that any and every product resembling a Spiderman should be protected. Many ceramists and piñata makers will create unique pieces of art — Ok, handicraft. But reading the copyright law more strictly, Spiderman is more treated as a trademark than as a copyright. And it is a trademark that should be declared as having passed on to the public domain. Yet another secretely negotiated international agreement that, among many chapters, aims at pushing a free-market based economy, as defined by a very select few — Most important to me, and to many of my readers: It includes important chapters on intellectual property and online rights. Hundreds of thousands of us along the world took part in different ways on the (online and "meat-space") demonstrations against the SOPA/PIPA laws back in February 2012. We knew back then that a similar project would attempt to bite us back: Well, here it is. Only this time, it's not only covering copyright, patents, trademark, reverse engineering, etc. — TPP is basically a large-scale free trade agreement on steroids. The issue that we care about now is just one of its aspects. Thus, it's way less probable we can get a full stop for TPP as we got for SOPA. But we have to get it on the minds of as many people as possible! Learn more with this infography distributed by the EFF. The countries currently part of TPP are Chile, Peru, New Zealand, Australia, Malaysia, Brunei, Singapore, Vietnam — And, of course, the USA. Mexico, Canada and Japan are in the process of joining the partnership. A group of Mexican senators are travelling to Lima to take part of this round. I tried to tune in with Peru's much more organized call — The next round of negotiations will be in Lima, Peru, between May 14 and 24. Their activities are wildly more organized than ours: They are planning a weekend-long Camping for Internet freedom, with 28 hours worth of activities. And this will be at Facultad de Ingeniería. Another explicit goal of this session will be, of course, to bring the topic closer to the students! So... I am posting this message also as a plead for help. Do you think you can participate here? Were you among the local organizers for the anti-SOPA movement? 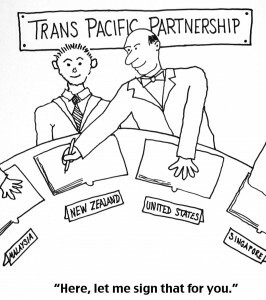 Do you have some insight on TPP you can share? Do you have some gear to film+encode the talks? (as they will surely be interesting!) Or, is the topic just interesting for you? Well, please come and join us! 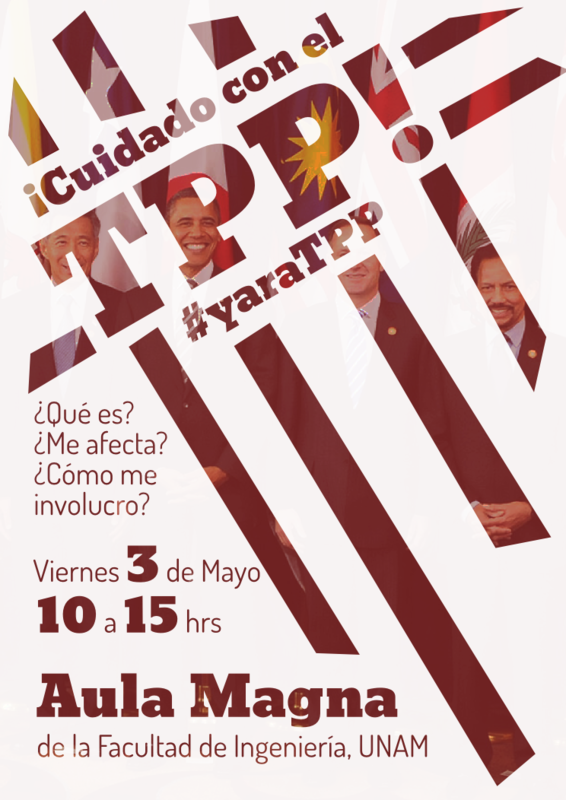 ¿Qué hay de malo con el #TPP? Video explicativo: "Will TPP turn Internet service providers into copyright cops?" Gunnar Wolf, Salvador Alcántar: ¿Qué es TPP? ¿Por qué me debe preoucpar? ¿Qué podemos hacer? Saturday, February 23 is the International Day of Open Data. Following its policy of promoting free, open and unrestricted access to the results of research funded with public money, CLACSO calls research centers and individual researchers to free their public data so they are available for other researchers and, most importantly, for the community as a whole. That's the reason CLACSO invites researchers and institutions to announce in social networks, mentioning "#DatosAbiertos #OpenData", which are their freed public documents, pointing to the web pages where they can be found. Call towards adding data catalogs in Latin America and the Caribbeanin the Data catalogs directory, in Datacatalogs.org, and in Open data census. We can between all contribute for the Latin American and Caribbean open data community to grow, democratizing access to public data about our societies. So, what do I consider worthy of adding to a list of resources I can point to? I am part of the team that set up and has worked on convincing the Economics Research Institute (my workplace) academic groups to publish their research results and products in our institutional repository under Open Access-friendly licenses (CC-BY-SA-NC and more liberal). We have published a wealth of economics-related information there; I must thank and single out Víctor Corona, who has been long working on the digitalization and re-publication of the institute's journals from the (at least) past three decades. As the repository administrator, I am part of the RAD-UNAM (Red de Acervos Digitales, Digital Repositories Network) in our university. We administer at least 10 similar repositories in different institutes and faculties, and work on finding how to promote acceptance of open access ideas in UNAM's academic circles, and providing standards-based ways to share our work. As part of my information gathering activities for the e-voting analysis work we have been doing, I have set up the E-Voting observatory in Latin America site, where I gather the news I find on the topic, flagged by several categories. As for my personal work, although I am pretty young and little in formal academia, I publish most of I write in my personal webpage. Several different topics are at hand; of interest to this initiative, I think it's mostly the e-voting articles and presentations. Rogerio Azcárraga, president of Radio Fórmula and of Orfeón, talked about the great careeer he has had on the music business. While doing so, he clearly shows (and Alejandro Miranda did a very nice job selecting ~10 minute highlighting it) how "successful industrial culture" in Mexico is equivalent to living off the works of third people — For the ridiculous period of lifetime plus 100 years. The interview is in Spanish. But if you understand Spanish... Don't miss it! diálogo sobre artes, regulaciones y disponibilidad de la cultura» at the beautiful Foro del Dinosaurio in the Museo del Chopo, located very centrally in Mexico City. The list of speakers is quite interesting, and makes me very interested and happy to be there. The culture and its industries in the digital age: What are the interests at stake? Intelectual, cultural and scientific works: Open access or availability? For further details on the participants, go to the laboratory's web page. Update: The talks will be streamed! http://www.chopo.unam.mx/chopoenvivo.html, via UStream. Update About one year after this activity (which was very interesting!) I was contacted by the organizers. They will be publishing proceedings — Transcriptions of our participation! Yes, a transcription is never as easy to read as a text created as such, but I am very happy of this. I was sent a first version of my transcription, which I'm attaching here. It has several corrections to be made (which I asked them to do), but it's surely worth sharing! I heard about this initiative in Iván Martínez's Wikimedia talk at COSIT 2012, held last week in Coatzacoalcos, Veracruz (I intend to write a bit more regarding COSIT later on). 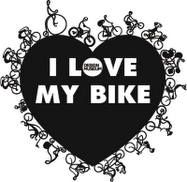 I loved the idea, and intend to participate — Not because I take great pictures (I don't, and I usually take them using my aging phone, which gives decent results but nothing beyond that), but because I love to move by bike in the city, and it's one of the best ways to roll in front of some of them. But more on me later… Back to the topic! WikiLovesMonuments aims to improve on Wikimedia's (the organization behind Wikipedia and several other Free Culture reference projects) coverage of important landmarks all over the world. To do so, they are offering a trip to attend WikiMania 2013 in Hong Kong to the first place winner, and other "photography-related" prizes to the other winners. So, back to me: My motivation to enter the contest is to help Wikimedia. I know my shots won't be top-notch (although they will be the best I can do). I enjoy biking in my city, and often go not too far from many of the listed monuments. I am amazed at the number of monuments still pending in my area (of course, it's not by mistake this is called "La ciudad de los palacios", The city of the palaces) — Surely some of the readers of this post will have (or will find easy to take) some photos to add. Of course, I'll try to focus on the missing monuments, but if you are a good photographer, you might want to submit a better version for a monument that's already there. This is one of the days where reading my everyday newspaper was worth more than just getting bitter at the news. I found this text in La Jornada, my usual newspaper. I liked it very much, and decided to translate it for a wider audience. Of course, if you can read Spanish, do yourself a favor and go to the original. It is not that the text is so easy to translate. And, after all, I'm not a native English writer. I'm trying to do a literal translation, even when disagreeing with the author. Historical legacy. 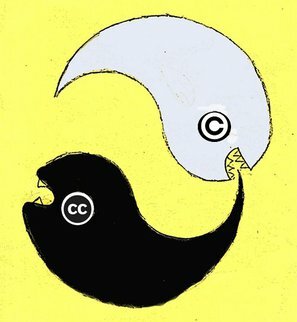 Criticists who promote the persecution of piracy and free downloads of cultural works from the Internet argue that the patrimonial rights have been wronged; they start off suposing that a cultural work is formed from a historical void, as if there was a "nothing" to begin with, and then a "something" appeared. Nothing more fallacious: All cultural products has its precedents, and thanks to these it generates part of its best forces. Opening towards the future. Human beings are projected into the future. As the main philosophies of the 20th century have explored, one of the singular characteristics of mankind is the ability to think and imagine the future. Products of culture are the best ways to think and project society, politics, love, hope, needs, failures… A song, a poem, an essay, can trigger imaginary worlds with a transformative potential. To deny this to humanity with "patrimonial damage" as an argument is to mutilate man's temporal nature. Recognition of the present. Cultural works generate moments of reflection, criticism and pleasure; they can trigger actions demanding commitment, solidarity and strong indignation against injustice. If every cultural work is adscribed in some way to a historic tradition, and if cultural products anre necessary to imagine other possible worlds and open our future, it's not less true that they also allow us to recognize our present by making us more sensitive to others' ideas, sensations and emotions. Without culture, there is no present nor others' presence. Divulgation of the cultural heritage. If culture is "heritage of mankind", it should be also spread by any possible way. But not just spread, but actively sought for the biggest number of people to be able to effectively have access to it. In a potentially interconnected world, Internet is the most adequate world for it (despite its limitations). Therefore, penalizing free downloads means avoiding spreading it and restricting access to those groups who don't have enough economic resources. Preserving cultural heritage. If we agree that cultural works are heritage of mankind, we need to take every action needed to preserve them. But preserving culture does not only mean keeping the products in museums, galleries or never-polluted drawers; it rather means to keep them in the collective memory and in the flow of constant interpretations and appropiations. Said in other words, the genuine way to preserve culture is to allow universal access to cultural goods. That's why, holding that free copies and downloads of books, music, videos, etc. over the Internet are harmful, is an incompatible argument with the obligation to preserve cultural heritage. They are not goods. Cultural works are material and spiritual manifestations of mankind, concretions of its historicity; they are, also, expressions of emotions, ideas and projections of other lives and other worlds. That's why they cannot be equated to goods or inserted in patrimonialist logic. The market might want to cheat by giving a certain price to a painting by Orozco or auctioning a Baudelaire manuscript, but it will never be able to aprehend their true meaning as cultural works. And it's not that culture is not faluable, but taht its estimation criteria do not follow the rules of market, but those of the imponderable and unlimited. Price disproportion. Assuming we accept the possibility that intermediaries charge for the services they perform, the value of a book, record or movie should never exceed the daily wage of a worker or employee. But this ellection would only be one more option within the effective possibility that people opt to download or freely copy the cultural work. The final decision as to which media to go to should be a sovereign resolution of the culture-interested person. The principle of the most benefit. Even when copies and free downloads over Internet could generate a patrimonial "wrong" to third parties, the cultural benefit obtained by it will always be greater in as much that it carries out intensely the principle to foster, spread and access the cultural heritage of mankind. To think otherwise is to privilege the few over the many. Against the intermediary-salesman. Culture does not need intermedieries that reduce cultural works to goods. Culture is too important to leavie it in the hands of salespeople that simplistly equate cultural goods with cakes. An intermediary of this kind will never understand the difference between a work of art and a disposable razor blade. What the world needs is more support from the government from every country to artists, creators and poets, as well as ensuring the conditions for the absolute mobility freedom for cultural works.